I remember sitting in religion class as a Catholic school student and being taught that statement. I also remember being confused by it. Wasn’t faith a choice? If it is a gift — does that mean not everyone gets it? Shouldn’t God give it to everyone? Lots of questions ran through my brain as I scratched my head. It didn’t make sense. I didn’t get it. I am sure I thought the teacher was wrong and had no idea what she was talking about. My faith has been my guide. My faith has been my comfort. Faith has provided me with hope and an Eternal Father to look up to, run to, and a higher being to present my every need. Many faiths view adoption as a good and holy act. The Catholic religion, like other Christian denominations, encourages adoption as a life choice and a way to build a family; especially for those who struggle with fertility. Adoption has been in my heart since I was in 8th grade. Long before Brad and Angelina, I dreamt of having a family that was diverse and represented all of God’s children. So after facing fertility issues, it was an easy choice to turn toward. I am blessed to have a husband that embraced the decision to adopt. But that decision came with more decisions. For a long time, we wondered whether we should pursue domestic adoption or international. It was around that time that I heard Joel Osteen speaking about how difficult it can be to pray, “not my will Lord, but Yours”. Osteen suggested to his listeners to pray that prayer in a way that seemed a lot easier to me. He said, pray, “Lord, open all the right doors and close all the wrong ones”. I feel like almost immediately after I prayed that, international adoption doors seemed to close. Domestic adoption doors looked wide open. What a relief it was to feel like we were being pulled in a certain direction. 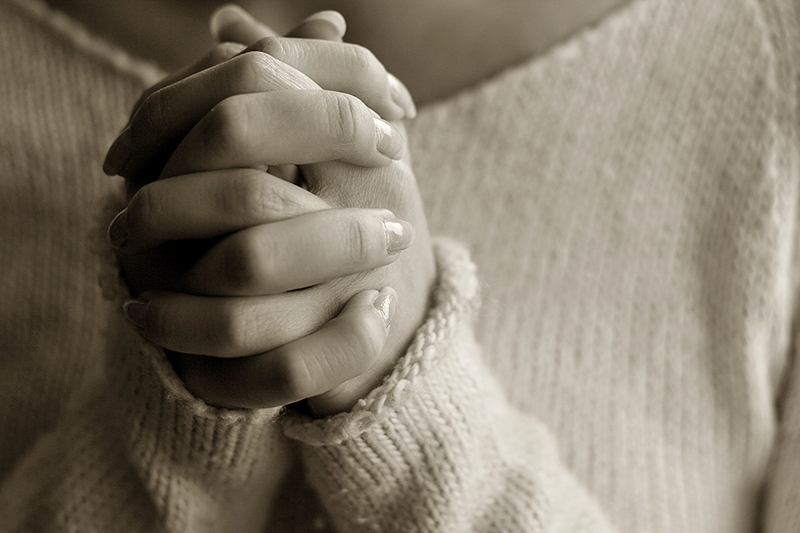 Both my husband and I relied on prayer for many challenges in our lives. Our journey to parenthood was no different. First we prayed to conceive. Then our prayers changed toward adoption. We constantly prayed — and continue to pray — that God bless us with children; that God lead us in the right direction, that God lead a young woman towards the choice of adoption over abortion. We constantly pray. Jesus’ Gospel message to be persistent in prayer has given my husband and I so much hope. There is so much hope in prayer! Not only did we pray, but family and friends prayed for us too. The love and gratitude we felt when others told us we were in their prayers is indescribable. It is such a wonderful feeling to know that our hope is also in the hearts and minds of others. There have been many times when my husband and I felt discouraged during our wait to adopt. Although we had our good and bad days, we never stopped looking up. I recall being in the midst of waiting for what felt like a very long time. I was a teacher and I must have worn my worries on my face as I walked the hallways. On at least one occasion, Sister Mary Boyle, the art instructor, said to me: “Shake your fists at Him” (she was talking about God). I never expected a woman who dedicated her whole life to serving the Lord to give me the advice, “Shake your fists at God”. I don’t know if there is any theological wisdom that could back the “shake your fists at Him” theory, but I do appreciate that even a nun knows that faith is not always easy. Sister Mary Boyle may have just been saying to me, “it’s okay to be sad or angry”. We are human, and humans have feelings. Maybe she wanted me to know that having faith doesn’t mean we can never feel sad or frustrated. It just means to never give up hope. I don’t know how anyone gets through adoption or life, without hope. In the Catholic tradition, faith, hope, and love are known as theological virtues. Love makes all things work. I would change the “easy” to “easier;” but I see the truth in this phrase. So, whether you are in the “full of hope” phase of adoption, or the “shaking your fists” phase — it’s okay. Just don’t stop believing. Have faith in your adoption journey.